I finally feel like I’ve found a useful way to utilize my Pinterest addiction! If you haven’t heard of pinterest, it is a site that allows you to create boards that you can pin pictures of items, which also allows a link back to the original site. It’s a great tool for planning, organizing, and remembering those cool recipes, crafts, and other things you find on the world wide web. I will warn you…it is addicting…once you start pinning, you just.can’t.stop. Ask Merissa, who noticed my homemade pop tart pinning obsession over the weekend! Back to how I’m using it for meal planning. For weeks now, I’ve been pinning recipes that look yummy and that I think our family would enjoy (with the Pin it button in my browser). I have several food boards that I’ve been pinning to including No Meat Dishes, Yummy Foods, Budget Friendly Foods, Fun Food (usually things that are really cool looking that would never turn out that pretty for me! ), and more. I’m a little obsessive about the food on Pinterest. Yeah, I can pin it but can I cook it? That is the ultimate question. Sooo….I’ve decided to use Pinterest for my weekly meal planning, which we need as I’ve been winging it quite a bit lately. 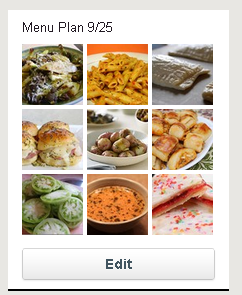 This not only gives me the links to the recipes but it gives me a visual of what I have planned for the week. When I click on that board, it takes me to all the pins I’ve moved to the Menu Plan Board. You can easily move your pins from board to board with the edit function. Once I had my menu set, I made my shopping list. There were specific recipes I was looking for as I had some items in the pantry and freezer that needed to be used. I tried to plan several recipes around similar ingredients like the basil so the package wouldn’t go to waste. Most of the items that were on my shopping list with this plan was produce and a few spices. If you want to see my boards, follow me on Pinterest! Thanks for the useful tip, Briana! I, too, am addicted to Pinterest!